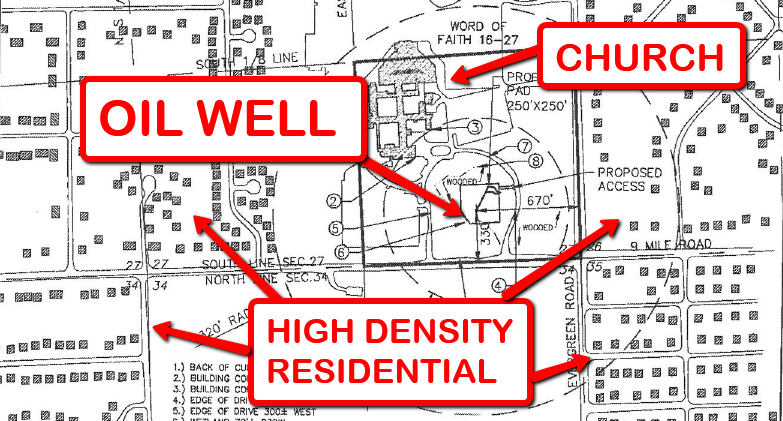 Information regarding the planned oil well on the Word of Faith church property. 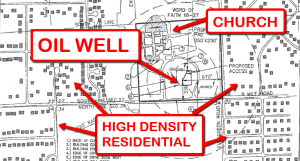 Jordan Development, an oil company, applied with the Michigan DEQ for a permit to drill for oil and gas at a church, Word of Faith, in a high density residential area of Southfield, Oakland County, Michigan. The City of Southfield currently has a moratorium on oil and gas extraction and mining operations in the city. State Representative Jeremy Moss requested that the MDEQ hold public hearing. The hearing took place on February 17, 2016 with over 1,000 residents attending. On March 8, 2016 the MDEQ approved the permit allowing the drilling to take place. The city administration said it will request a temporary restraining order through Oakland County Circuit Court to stop the drilling if necessary. The planned oil well will be located on the private property of Word of Faith church in Southfield. The church is located in an area zoned residential and surrounded by high density residential neighborhoods. The church contends that the oil well will benefit the community. The residents of Southfield have held numerous protests at the church and attended town halls and community meetings voicing their opposition.